One of the things we heard often was that the FIDO was great for meals in a jar – BUT the lid hanging down was a pain…. along came Luigi Bormioli (who now OWNS the Rocco Bormioli glass company and their FIDO jar brand) with a great, but fairly expensive, upgrade. Is it worth the cost increase for the Lock Eat program – so far out customers appear to thinks so – the entire lid comes off and seals back with 1 motion! … restaurants and stores using for display have been buying up a ton….. it will never replace the FIDO for storage or canning – but for display and meals in a jar – SUPERB in our opinion. 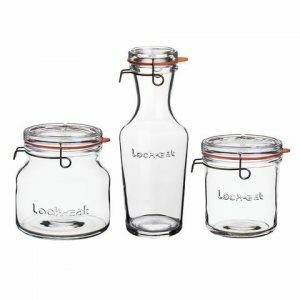 Check out the selection at glaspak.com – they even have a large mouth Juice jar … a great new idea! This entry was posted in General on May 15, 2018 by GlasPak. Kombucha Tea dates back to around 220 BCE and was primarily used in the Manchuria, Russian and Eastern Europe regions. Currently the United States is seeing a boom in the production and consumption of Kombucha Teas. Kombucha is a verity of fermented, effervescent sweetened black or green tea drink. By fermenting tea using a colonies of bacteria and yeast (SCOBY), Kombucha is said to have multiple health benefits. Our Italian Glass Swing Top Bottles are perfect for your Kombucha bottling needs! WARNING – Do not use a square bottle for any fermented or highly carbonated beverages. Please only use Round Bottles as Square Bottles have a tendency to break when exposed to the pressures developed during fermentation or during carbonation. This entry was posted in General on May 18, 2017 by GlasPak. With Spring finally showing up in parts of the United States it is time to start thinking about your fermenting needs for your new crops. Our full line of Bormioli Rocco Fido Jars are great for all your veggie and cabbage fermenting needs! Our Hermetically Sealed Swing Top Glass Jars are great to keep your veggies fresh and and keep oxygen out! This entry was posted in General on March 30, 2017 by GlasPak. This entry was posted in General on July 27, 2016 by GlasPak. Pre-heat oven at 350 degree F.
In a medium bowl, mix together apples, sugar, cinnamon, nutmeg and cornstarch. Make sure apples are evenly coated. Unroll pie crust dough. Press dough to fill the interior mold of each mason jar to the top edge. Scoop apple mixture into your prepared mason jars and top with 1/2 inch strips of pie crust forming a lattice. Wholesale Glass Bottles – larger order site! Found this PDF file for canning in a Bormioli Rocco Fido jar .. This entry was posted in General on January 11, 2016 by GlasPak.